This is the third piece in my Gesture series, a series of works that use imagery of my own hands. I start with a basic concept, one that by definition is concise and easily understood. However, these concepts often are viewed differently by each of us, as our experiences and point of view greatly affect our interpretation and personal meaning of these ideas. From this simple concept, I use the images of hands to build upon the idea and make it my own. Birth represents the creation of something from others. 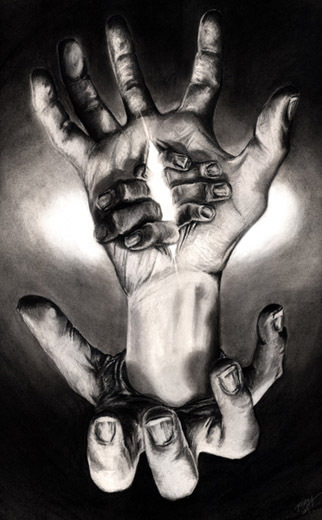 Just as the two hands spring forth from the palm of the middle hand, so to does that hand arise from the bottom hand. My brother sees this piece as my rendition of the personal birth, or rebirth more precisely, of my artwork. During my years in graduate school I didn’t devote much time to making art, however, it is now an integral part of my life, and growing more and more.